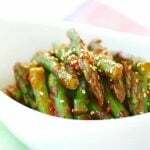 In this post, I’m updating gaji namul that was originally posted on March 16, 2010 with a better photo and slight changes to the recipe. 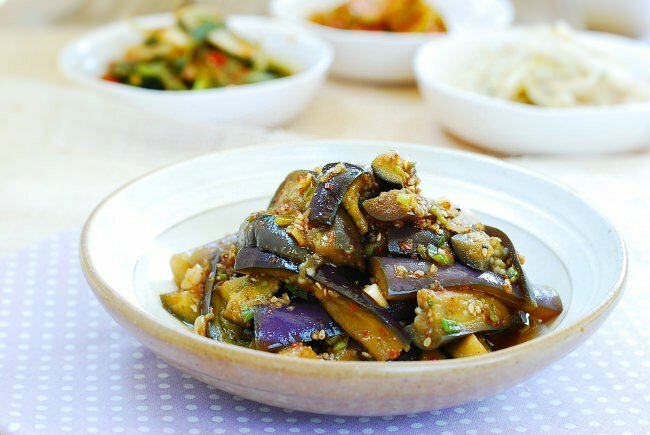 Gaji namul is a popular summer side dish that is made with steamed eggplants. 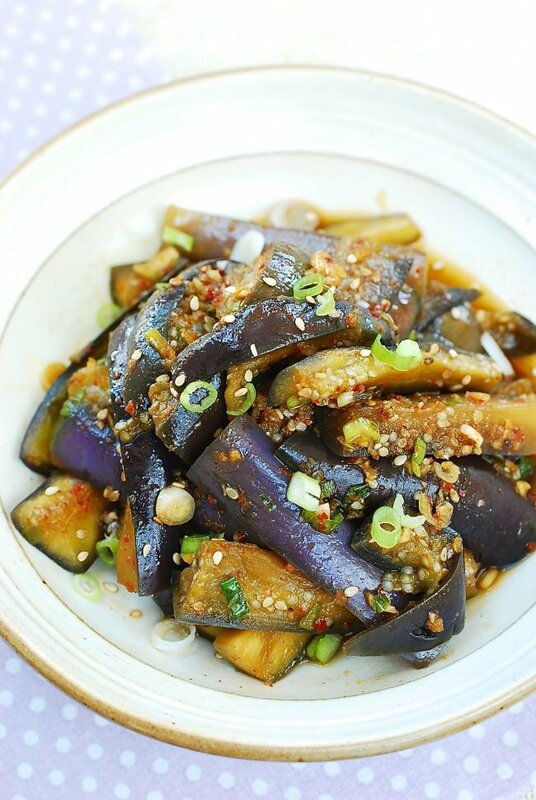 The traditional way of making this dish is to steam the eggplants and then tear them into small strips. It’s very easy to overcook eggplants, resulting in mushy eggplants that fall apart during the tearing process. 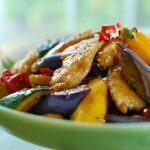 You can avoid this by cutting the eggplants into bite sized pieces before steaming them quickly. The key is to steam the eggplants until they are tender but still slightly firm. Eggplants are in peak season now. 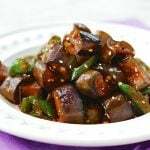 You should use Korean/Asian eggplants for this recipe. They have tender skin and sweet flesh. Look for slender eggplants with a rich purple color and shiny skin, and without any soft or brown spots. Gaji namul is easy to make but tasty and healthy! Cut the eggplants lengthwise in quarters. Then cut crosswise into about 2-inch pieces. Boil the water in a pot with a steamer tier or basket over high heat, covered. Place the eggplant pieces in the steamer, and steam until softened but still a bit firm, about 3 minutes. Transfer to a bowl to cool.Add all remaining ingredients and gently toss everything together. Add more soy sauce to taste if needed. I just discovered your site today. All the recipes look so delicious! I’ve bookmarked at least 12 I want to try. 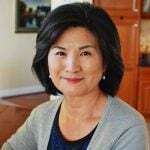 I’ve made a few traditional Korean recipes over the years so I’m familiar with many of the staple ingredients, but would you please share what brand of spicy gochugang paste, mirin, soy sauce and sesame oil you prefer? It would help me navigate the Korean market better. There are so many choices it can be overwhelming. Thank you for taking the time to share your recipes. Thank you! I generally use Sempio (샘표) soy sauce and gochujang, but other major brands such as Haechandeul (해찬들)and Chungjeongwon (청정원) are okay as well. For mirin, I just get what’s on sale, including Japanese brands. Sesame oil is a touch one to choose, but spend a little more for quality. Hope this helps. Let me know if you have any other questions. Thank you for your quick reply! This information is very helpful. I can’t wait to try your recipes. Heading to the market tomorrow to pick up your suggestions. Thank you again for the time and care you take in your recipes, photography, blog and replies. You’re welcome! This is my favorite as well. Thanks a lot for using my recipe. Enjoy! I made this recipe yesterday! It’s really good. it’s good still warm after just making it, and pulling it out of the fridge later. Thank you! That’s great to hear! Thank you so much for taking the time to let me know. Stumbled upon your blog while searching for recipes for my Korean food crazed family members. Thank you for sharing, will be trying out some of the dishes soon! Hi Jenny – Welcome to Korean Bapsang! I’m happy that you’ve found my blog. Hope you and your family enjoy my recipes. Thanks! 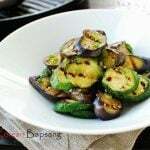 My family loves eggplants and I will definitely make this dish. I will report back to you. Thank you! Hope your family will like it. There are two more eggplants recipes on the blog. See if you like those also. Cheers! My friend and I made a chow fun dish tonight along with this eggplant dish, and it was delicious. That sauce is money. I can’t wait to buy more eggplant and do it again. I look forward to trying more of your recipes. That’s great to hear, Scott! Thanks for letting me know. 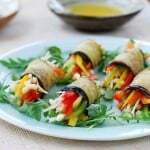 Hope you find many more recipes to enjoy on my blog. Thank for sharing this awesome dish. I know that many Korean side dish can last for months and week. Can I check for haji Namul how long does it last in fridge? This is not that type of side dish. It will be good for 3 to 4 days in the fridge. 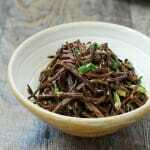 This is awesome to discover a blog where you share all these wonderful Korean recipes! I grew up in Hawaii where Korean food is available everywhere and I love it but where I live now, the closest Korean anything is at least 2 hours away. Your blog is a blessing and a treasure! Thank you for sharing! Can I use a insta pot to steam the eggplants tender faster? Of course, but cook very briefly.